Mindless Mirth: Something's Up With The Weather! There is something very strange happening in the USA. Is it something political? Is it a new flu outbreak? Is it terrorism? NO! It's the weather. Tornadoes are descending from the sky with a frequency NEVER SEEN BEFORE! Not only higher numbers of tornadoes, but more ferocious ones that seem to be hell bent on death and destruction are turning 2011 into the year of the storm. 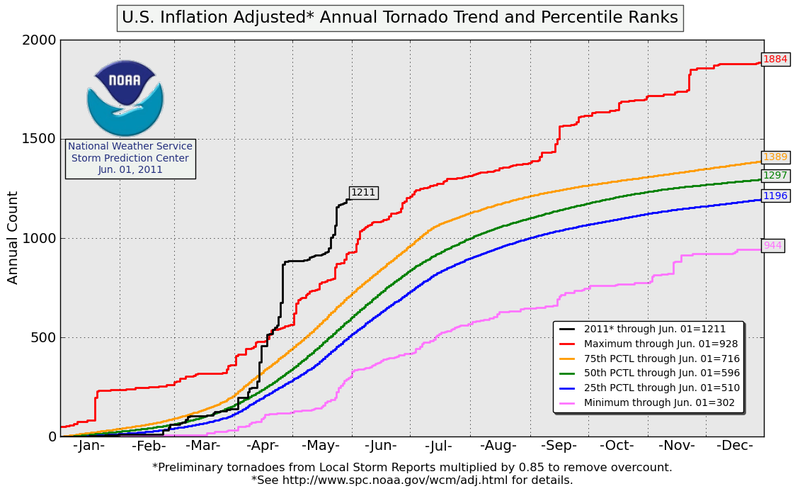 Surely there have been years with more tornadic activity than 2011, right? Wrong! NEVER IN RECORDED WEATHER HISTORY HAVE THERE BEEN MORE TORNADOES THAN 2011! CLICK ON THE ABOVE CHART FOR A FULL SIZE VIEW! 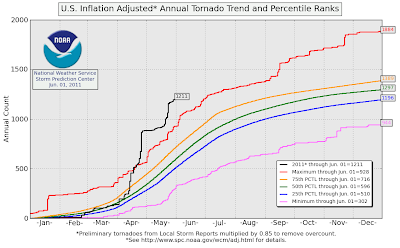 The chart above clearly shows that this year is like NO other in terms of tornado activity. As of June1, 2011, 1211 tornadoes have been confirmed so far this year. It's also important to note that this count has been reduced to 85% of the actual tornadoes reported to account for any possible over-count until all reports can be confirmed. This means that over 1400 tornadoes have been reported as of June 1, 2011. This is nearly 500 MORE tornadoes than any other recorded year in history. It doesn't end there though, not only are there more tornadoes, but they are far more deadly than ever before too! This year, 537 people have perished due to tornadoes, and this is truly an incredible amount of deaths. I'll put it into perspective for you. In the 10 years before 2011, 564 people died due to tornadoes. 564 in 10 years is an average of 56 deaths per year, compare that average to the 537 deaths so far in 2011 and you quickly get the picture. Something is surely amiss with the weather! Between April 25 and 28, a historic tornado outbreak now known as the 2011 Super Outbreak took place across much of the Southern United States as well as parts of the Midwest and Northeast. With over 300 confirmed tornadoes and 317 tornadic fatalities, the outbreak ranks as the worst in United States history. Open your windows during a tornado. Tornadoes can't cross water or where rivers meet. Tornadoes can't/don't hit big cities.